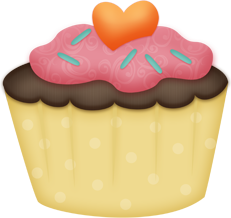 Seasons change and so do cupcakes! These items are available for a limited time only. Place your order today to ensure you're not left in the cold this holiday season. Some of our holiday favorites are Beyond Carrot Cake, Sweet Potato Surprise, Pumpkin Delight and Holida Chunk! Be sure to check out our gift sets. These make perfect holiday presents! 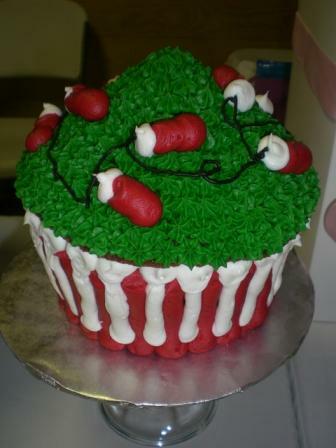 We will have 3 layered cakes available this holiday season. Please contact me to place an order. 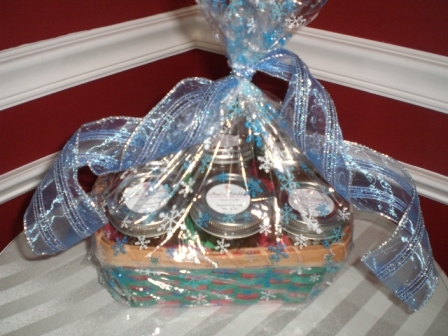 Unique gift basket filled with 6 Mommy Jars perfectly wrapped for that special someone! Actual basket may vary from picture. 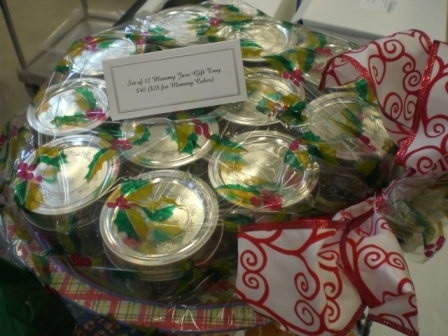 This festive treat features 1 dozen Mommy Jars of Love (single flavor) on a holiday tray, wrapped and ready for delivery. This makes a sweet treat for those special accounts and offices. We will deliver to you or to the recipient. Througout the year, other than Christmas, tray may be a basket.